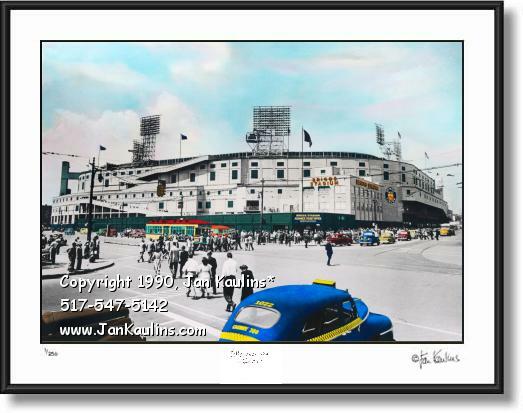 BRIGGS STADIUM photo picture print photograph poster art for sale. DETROIT Briggs Stadium picture photography print art photos for sale - BRIGGS STADIUM Detroit, Michigan - Detroit Tigers old Briggs Stadium picture photo hand-colored black and white art print photo for sale. This Detroit Photo Gallery historic Detroit Tigers Briggs Stadium baseball photo is a picture of a hand-colored black and white photograph of The Detroit Tigers old Briggs Stadium in The City of Detroit, Michigan. This Briggs Stadium photograph is a picture photo of the home baseball stadium of The Detroit Tigers from 1938 to 1961, after which time Detroit Briggs Stadium was re-named Detroit Tiger Stadium. Detroit Tiger legend AI Kaline began his playing here at historic Detroit Briggs Stadium and the Detroit Tigers managed to win two American League pennants and a World Series during those years. In this historic Detroit Tigers Briggs Stadium Fine-Art photo picture note the old streetcars and vintage vehicles, including a late 1940's Detroit Taxi. This is a wonderful historical old Detroit Tigers Briggs Stadium photo of an early era in old Detroit Tiger Stadium baseball history. TO SEE THE MANY OTHER DETROIT PHOTOGRAPHS FOR SALE IN THE DETROIT PHOTO GALLERY, INCLUDING DETROIT AERIAL PHOTOS, DETROIT LANDMARKS, HISTORIC DETROIT PHOTOS AND DETROIT SPORTS PHOTOS, CLICK ON THE 'BACK TO...' LINK ABOVE THIS PHOTO NEAR THE TOP OF THIS PAGE OR CLICK ON THE 'HOME-RETURN TO ALL GALLERIES' LINK BELOW.